In her book, “Passion Brands,” Kate Newlin describes a passion brand as a brand you form such a personal attachment to that it becomes an indelible aspect of your identity even when no one is looking. Hershey Kisses is one of the brands that she references in her book. Hershey Kisses has built a strong emotional connection with chocolate lovers. With Easter six days away, it is a good time to talk about chocolate brands. 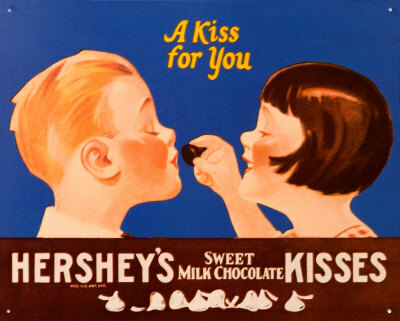 Hershey’s Kisses milk chocolates were introduced in 1907. The candy got its name from the machine that made them, which made kissing sounds and appeared to “kiss” the conveyor belt onto which the chocolate was dispensed. Hershey Kisses has been an American icon for over 100 years. It is one of the most loved brands in the country. The brand is a symbol of love and affection: a wonderful way to connect with loved ones, both family and friends, great to share and always appreciated. It has a truly unique shape, taste, and texture that delivers a one of a kind chocolate experience. The foil wrapping adds to its uniqueness and makes you feel like you are receiving a gift. It is a special treat that can be eaten everyday. It is a perfect gift and it tastes good. Growing up, Hershey Kisses were always my favorite chocolate and even today it is my mother’s favorite chocolate treat. Over the years, Hershey has introduced a number of new varieties including almonds, special dark, hugs, caramel, cookies n cream, and air delight. You can also send Hershey Kisses with a personalized message. Hershey Kisses has produced great advertising to promote the brand. Hershey offers the ability to order personalized kisses for a loved one or friend. This is another way Hershey Kisses enables connections. What is your favorite brand of chocolate?